The TV is no more passive broadcast receiver, it is turning smarter with a computing and digital networking capabilities. To connect seamlessly to a smart phone or a media server in-home and also to Internet, Smart TVs are integrated with additional electronics for computing and networking which requires more number of semiconductor ICs. To support high-definition digital-video, even the basic television circuit is using much larger and complex semiconductor content compared to traditional televisions. The leading semiconductor market researcher IC Insights has released its latest findings on the growing semiconductor content in TVs. 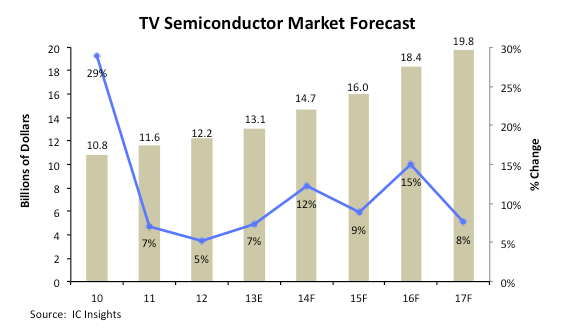 IC Insights has forecasted the semiconductor market for TVs to increase by an estimated 7% to $13.1 billion(See the figure below). IC Insights says technologies such as wireless video connections, networking interfaces, multi-format decoders and LED backlighting have boosted the average semiconductor content in TV sets even as global TV unit shipments are forecast to decline by an estimated 3% in 2013. IC Insights projects that total global semiconductor revenue for televisions will grow 12% to $14.7 billion in 2014 due to an uptick in new TV sales in advance of the 2014 Winter Olympic Games and the 2014 FIFA World Cup. Between 2012 and 2017, the semiconductor market for DTVs is forecast to grow at a healthy pace of 10% percent annually, increasing to $19.8 billion at the end of the forecast period. Though the transition to digital TV broadcasting is largely complete in mature markets like North America, Western Europe, and Japan, the transition continues in emerging markets throughout Latin America and Asia-Pacific. Through the forecast period, Chinese manufacturers are expected to flood the Asia-Pacific market with new (primarily low-cost) TVs. However, it is worth noting that China’s leading TV makers, TCL Corp and Hisense Electric Co., also are accelerating their push into the U.S. market and trying to grab marketshare from Japanese and South Korean vendors. Across all regions, shipments of Smart TVs and TVs with 3D technology are helping boost semiconductor content. The new IC Market Drivers report concludes, however, that both of these technologies face significant challenges in the next five years. Challenges for Smart TV include fragmentation of platforms and standards and the strong likelihood for technology obsolescence after only a few years. Meanwhile, the market for 3D TV took a hit earlier this year when ESPN announced that it planned to discontinue its 3D sports coverage and close its 3D sports channel by the end of 2013 to focus its time and efforts on improving traditional high-resolution broadcasts. 3D-equipped TVs are expected to grow to an estimated 23% of total TV shipments in 2013, but this may be a “false positive” since manufacturers now include 3D technology on many of their new TVs even though consumers aren’t using the feature. A couple of technologies showing considerable promise are curved-panel organic LED (OLED) TVs and 4K or Ultra-high definition (UHD) TVs that feature twice the resolution of today’s existing HDTV sets. Additionally, the IC Market Drivers 2014 report points out that significant changes are underway as traditional cable and satellite service providers face new and renewed threats from Google, Apple, Amazon, Intel, and others to provide alternative methods to viewing one’s favorite shows.